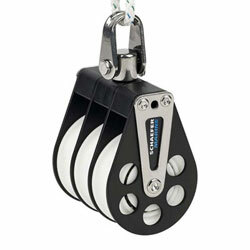 Maximum Line Size: 1/2", Safe Working Load: 1700 lbs. Schaefer Series 7 Blocks offer medium sized cruising and racing yachts a winning combination of strength and performance. The robust yet lightweight construction produces an exceptionally strong block that will outperform other plastic designs. These blocks are made from the toughest high-impact materials available, you will be out sailing while others are home fixing failed gear.